For an episode with such an ostentatious name “The Pain of Living” Episode 3 of Itachi Shinden is not what you’d expect. As if I told you last week we’d be looking at a comedy about Ninja Cats you’d have told me I was insane. Yet here we are, Itachi one of the most tragic heroes of shonen manga a character that at times goes through nearly Shakespearean levels of pains and suffering is the straight man in a ninja buddy comedy. I couldn’t make this up if I wanted to, mostly because I’d never want to. However moving on lets see how Itachi: Cat Wrangler works out. Following the events of last weeks episode Itachi has graduated from the Ninja Academy in record time making his a full fledged ninja of the village a Genin. Walking alongside of his father Itachi notices the people of the clan looking up at Fugaku with pride. When Fugaku wonders why Itachi looks so happy he explain as the face of the Uchiha Itachi is proud of walking next to his father, once again showing how much love and devotion the young Itachi has for him. This of course is important as Itachi will one day betray his father. Blushing Itachi - something you don’t see every day. As they walk Itachi comes across Izumi the young girl who is most in love with Itachi. Sitting on the docks alongside the Uchiha training ground Itachi and Izumi share a cute couple moments as she offers him dumplings. Not much really happens except further confirmation that Itachi and Izumi share something likely more then friendship. However this changes at the mention of the Sharingan which Itachi desperately wants to manifest. 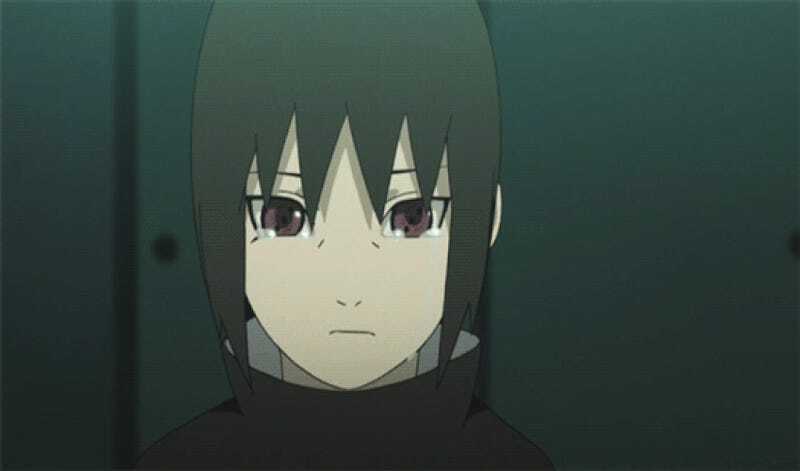 However as we know Itachi has yet to go through the trauma necessary to awaken the Uchiha’s most distinctive ability. Moving on Itachi is on a mission with Team Two which includes his Jounin leader Minazuki Yuki and his two teammates the kunochi Shinko Inari, and the jealous Tenma Izumo. Tenma seems standoffish towards Itachi for the same reason most are due to his abilities he is very much younger then his fellow Genin, this much like at the academy fosters resentment in Tenma visa vie Itachi. Honestly though the three of them are not the most important as we shall see they play a rather small even if important role in Itachi’s life - they merely seem to be regular people caught up in Itachi’s life. Neko-Itachi... this episode is like some bad fan fiction. Funny enough the mission is given by the enigmatic Nekobaa-san a character we’ve actually met before. While on the outside she is a crazy cat lady Nekobaa-san is in fact a very prolific arms dealer that supplies the Uchiha clan. While she is giving Itachi a mission today she will years in the future be surprised when another Uchiha “Kitten” Sasuke comes to by weapons which he’ll use to one day kill Itachi. The circle of life... and cats apparently, hey its Naruto doesn’t need to be profound all the time after all. The missions goes as one would expect from an episode where our “heroes” are wearing cat ears. There are some sight gags and slapstick comedy that lands and doesn’t which can actually be funny by how bad it can be. What is funny though is the missing ninja cat is merely a lovelorn drunk who is getting worn down by the pressure to get married, where he instead attempts to find peace at the bottom of a catnip liquor bottle. Drunk Ninja Cat is funniest Ninja Cat. The side quest of Tenma attempting to get a ninja cats whiskers to save his sick day is also completed. I didn’t mention this earlier as well... it’s kinda perfunctory and didn’t really make much of a difference. All it showed is Itachi as a child cares and is a very good teammate even if he isn’t much liked by the person he’s helping. However not surprising after the mission Shinko explains to Itachi and Tenma they are in fact friends, kind of mirroring Sakura’s influence of Naruto and Sasuke on Team Seven. She hammers her point home but punching both Itachi and Tenma again much like Sakura would or Tsunade even earlier. Showing how while not very original Itachi Shinden stands on the shoulders of its predecessors much in the same way the original manga did. 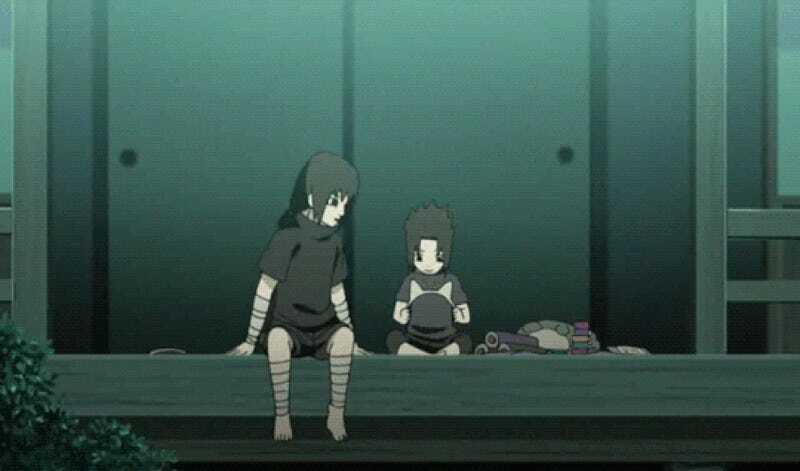 At the end of the episode Itachi is spending time with Sasuke thinking to himself about his friends. However he keeps referring to them in the past tense, why will become clear very soon. It seems during an unknown mission Itachi and Team Two were ambushed by a mysterious masked man who looks very much like Obito Uchiha as Madara. During the attack the entirety of Team Two is killed leaving Itachi alone. As he thinks back he quietly starts to tear up and as Sasuke looks on Itachi’s Sharingan is awakened for the first time. 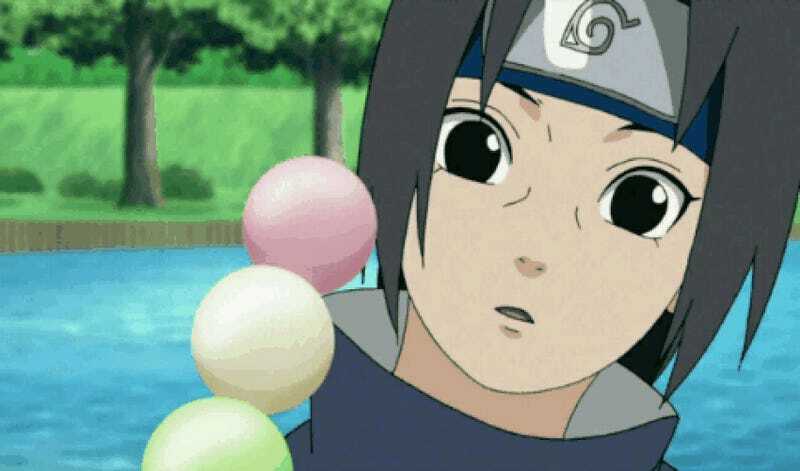 Looking at Sasuke he wonders if he’ll ever awaken these eyes and if his brother will know pain. While the majority of the episode was kind of pointless and uneven giving us little more then an extended look to Itachi as a person the ending was without a doubt a surprise. While it was known Itachi doesn’t spend much time with Team Two it is a shock to find how quickly it all ended for him. Furthermore it confirms that Obito took an interest in Itachi long before was officially shown previously inflicting pain and sorrow as he puts it very early in life. It’s likely Itachi’s changes over the years is due to direct and repeated pressure by Obito, however as we know Itachi’s purity is never truly broken. It was recently announced by Shonen Jump that both the Naruto Gaiden and Boruto sequel series will be getting new manga editions. Naruto Gaiden will have a one-shot chapter focusing on Orochimaru’s “child” Mitsuki written by Masashi Kishimoto. While Boruto will get a monthly manga serialization. For those wondering I’ll be covering those of those. Hope to see you there!